Experience the operatic elegance of Mozart's Great Mass in C Minor along with contemporary musings of Jake Runestad and Peteris Vasks. ​To learn more about this concert or to purchase tickets, click here. Join our San Camillo Senior Singers for their annual Fall concert (free). This group consists of seniors from the retirement community as well as the greater Milwaukee area. In addition to entertainment by the seniors there will also be sing-a-longs! ​To learn more about the Bel Canto Senior Singers, click here. Join our Mequon Senior Singers for their annual Fall concert (free). This group consists of seniors 55 or better from the greater Milwaukee area. In addition to entertainment by the seniors there will also be sing-a-longs! Join our New Berlin Senior Singers for their annual Fall concert (free). This group consists of seniors 55 or better from the greater Milwaukee area. In addition to entertainment by the seniors there will also be sing-a-longs! Celebrate the 10th anniversary of this Milwaukee holiday favorite with us. Traditional carols and beloved Christmas songs will get you in the spirit for this joyous time of the year. ...to purchase tickets over the phone, parking questions, and any other box office-related inquiries. This work by Richard Danielpour, inspired by interviews with veterans of WWII, the Korean War, and the Vietnam War, is a moving, unforgettable tribute to the American soldier and examination of the insanity of war. 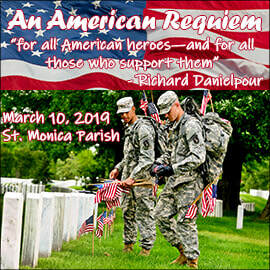 Danielpour wrote, "An American Requiem is not only about our relationship to war, but also our relationship to death as a part of life." How extraordinary that one of pianist and ultra-romantic composer Sergei Rachmaninoff's most beloved works is his 1915 unaccompanied choral setting of the Russian Orthodox All-Night Vigil. Filled with sumptuous harmonies and beautiful melodies, this monumental work, followed by the exquisite In Paradisum by Latvian composer Eriks Esenvalds, will deeply move you.